Obey those who ask no reward of you (for themselves), and who have themselves received Guidance. It would not be reasonable of me if I did not serve Him Who created me, and to Whom you shall (all) be brought back'." "Beyond the Darling River on the edge of the sundown, is where they used to say you would find Broken Hill, as if there was nowhere further to travel in Australia. Perhaps it was the feeling of suddenly being confronted by such vast space, like an inland sea rolling into the sunset. The desolate landscape surrounding the town is like driving towards a painting of soft mauve and sage hues. Is it any wonder the city has become known as a 'mecca' for artists? It is here that the magnificent clear blue skies and the magic light are also much loved by film makers. It is here that the big red roos run two hundred kilometres in a night chasing a thunderstorm, and the unique Sturt Desert Peas bloom in dark red soils." The term 'Broken Hill' was first used by the early British Explorer Charles Sturt in his diaries during his search for an inland sea in 1844. Western plains towns far away from the major rivers, such as Broken Hill, owe their existence to the mineral discoveries made in the decade after 1875, when spectacular deposits of gold, silver, copper and opal were found. The township of Broken Hill was developed in the "Broken Hill Paddock" which was part of Mt. Gipps Station. George McCulloch, the station manager, employed many men; and it was in 1883 that three of his workers pegged the first mineral lease on his property; they were Charles Rasp, David James and James Poole. (Drewery, 1985 & Camilleri, 2009). These men, along with four others formed the 'Syndicate of Seven' later that year. They were the original members of the Broken Hill Mining Company formed in 1883, who lodged applications for mining leases along the Line of Lode. 1. George McCulloch (1848-1907)-Station manager. 2. Charles Rasp (1846-1907)-Boundary rider. 3. Philip Charley (1863-1937)-Sheep farmer, employed as a boundary rider. 4. David James (1854-1926)-Tank and fencing contractor. 5. James Poole (1848-1924)-Employee of David James. Each member paid £70 to be a member of the Syndicate and in September 1883 they pegged seven 40 acre blocks along the Lode. The initial results were not encouraging and Poole, Urquhart and Lind sold their shares before the boom days and flotation of Broken Hill Proprietary (now known as BHP) in 1885. These men pegged out the remaining six mineral leases which are known as the Line of Lode. It was the seventh member of the Syndicate, Philip Charley, who found the first amount of silver in 1885 . (Drewery, 1985 & Camilerri, 2009). A township was soon surveyed and Broken Hill was initially a shanty town with an entire suburb named 'Canvas Town' for its temporary buildings. 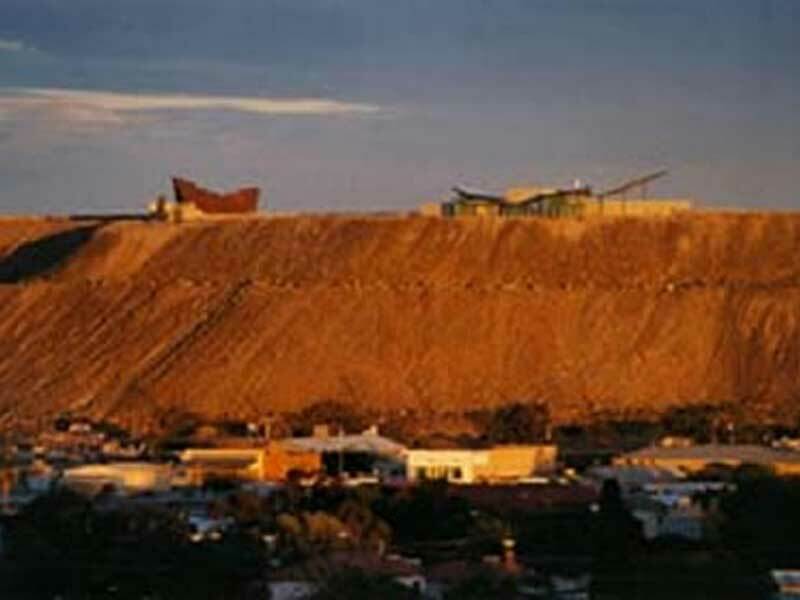 Today, the 'Line of Lode' is a 30 metre high mullock heap that bisects Broken Hill. The Visitor's Centre, Miners Memorial and Broken Earth Café perch atop this unmistakable landmark. There were some fifteen groups of Aboriginal people traditionally living in the huge area bisected by the Darling River in the western plains of NSW. 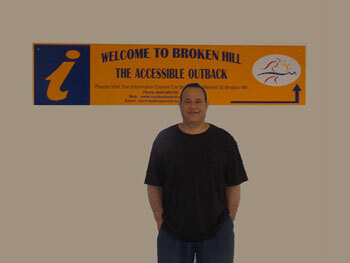 The principal group around Broken Hill was the Wiljakali Tribe. Their occupation of the area is thought to have been intermittent due to the scarcity of water. The same scarcity of water made the area unattractive for European occupiers, and traditional Aboriginal ways of life continued longer there than in many other parts of NSW, into the 1870s. However, mobility was essential to life in the mallee and sand hills, and as Aboriginal people were increasingly deprived of the full range of their traditional options, they were obliged to come into stations or missions in times of drought to avoid starvation. By the 1880s traditional lifestyles were largely supplanted by mission lifestyles, with many Aboriginal people also working on stations or within the mining industry. With the failure of most of the stations during the 1890s depression, many local Aboriginal groups were again displaced and ended up living in reservations created under the Aborigines' Protection Act of 1909. The influenza epidemic of 1919 had a further significant impact upon the indigenous population(HO, 1996, 192-193.) as did the twentieth century federal government policy of removing Aboriginal children from their families. Camel drivers led hundreds of camel trains throughout inland Australia in the nineteenth century and by the turn of the twentieth century their camel trains provided transport for almost every major inland development project. The cameleers laboured across the continent, carting produce, water, mail and equipment at a time when roads and railways were not constructed. The indomitable camels and their equally hardy keepers were crucial to momentous projects such as the construction of the Overland Telegraph, for which they carried supplies and materials used in surveying and construction work. They also accompanied a number of exploration parties into the little-known interior. These early Cameleers contributed greatly to the development of rural and remote Australia (Powerhouse Museum, 2008 & National Archives of Australia, 2007). It is estimated that some 20,000 camels were brought to Australia during the second half of the nineteenth century from all different parts of the world to work in the vast areas of inland Australia. Their drivers came from different countries and provinces such as Kashmir, Sind, Rajasthan, Egypt, Persia, Turkey, Punjab, Baluchistan, and former provinces of Afghanistan, now modern day India and Pakistan. Collectively they were known as "Afghans," although very few were actually of Afghani descent, it is now widely (and subjectively) used to describe the Cameleers (Australian Government: Culture Portal, 2009 & Camilleri 2009). The forerunners of the camels to enter the Broken Hill district were imported in 1866 by Sir Thomas Elder for use in Northern South Australia. The Afghans, or Ghans as they became known, were well established by the time of Broken Hill's discovery in 1883 and in succeeding years, camel teams and Afghans were a familiar sight in Broken Hill and the West Darling District of NSW. Camels were used to haul heavy wagons, and twelve or more camels were used to pull a ten ton wagon travelling at a rate at 15 miles per day (Powerhouse Museum, 2008). Once camp was reached the Afghans slept in a temporary corrugated-iron shed or bower of gum branches. They led a nomadic life with few personal possessions. The Afghans generally lived away from white populations, at first in makeshift camel camps, and later in Ghan towns on the edges of existing settlements(Powerhouse Museum, 2008). For most of the year they were solitary travellers lacking the camaraderie and powerful sense of community or 'Ummah' that Islam bestows. The Afghans performed their prayers five times daily out in the desert, the empty bushland, or countryside. In Islam great emphasis is placed on the conduct of prayer. Salat can be performed at any clean place ensuring that the worshipper is directed towards the Ka'aba in Mecca. A mosque, which is referred to in Arabic as a 'Masjid,' lit. 'Place of prostration', is a dedicated place of worship. It is a place to gather for daily prayers and festivals, and a place where the community come together for spiritual advancement, through prayers and remembrance and through religious education. A mosque can also be a reference point for other community activities. Mosques should remain an Islamic endowment (waqf) which is owned and looked after by the Muslim community. 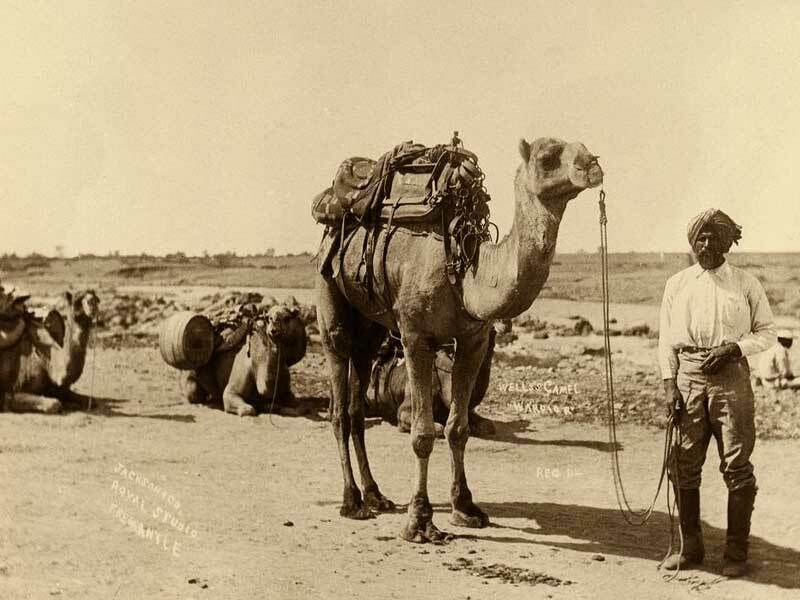 Within just six years of the arrival of Elder's first camels, and just a decade after Burke and Wills' first north-south crossing of the continent, the Afghans with their camels had built the overland telegraph from Adelaide through to Darwin that would connect Australia direct to London. The construction of railways was shortly to follow including the Afghan's namesake, the famous Ghan line from Port Augusta to Alice Springs. The Ghan service's name is an abbreviated version of its previous nickname 'The Afghan Express,' which comes from the Afghans that trekked the same route as the overland telegraph, which is said to have been the to be the route taken by John McDouall Stuart during his 1862 crossing of Australia before the advent of the railway (Burton, 2006). The Afghans travelled lightly and were always ready to move. The men were typically engaged on limited term contracts, and immigration laws did not allow for women or children to accompany them to Australia. Many therefore worked and lived communally as a brotherhood of fellow cameleers, observing strict religious and related halal dietary practices that tended to discourage significant social interaction with others. Theirs was an itinerate mode of dwelling negotiated spatially through movement, camping along the camel trails, resting between journeys in their Ghan towns (Scriver, 2004). Broken Hill was a central hub at which several important camel trails and stock droving routes of the outback met the railroad and became a prominent place of commercial interaction between Afghans and Europeans. With its high concentration of Afghans, the camp at Broken Hill developed as one of the most established Ghan towns of the outback (Camilleri, 2009). The Ghan town along with the dwellings of the local Aboriginal people were rarely located near the centre of town, which clearly segregated the whites from the 'others'. Essentially in towns where the Afghans worked there were three groups, a camp for the Afghans, a camp for the local Aboriginal people and, in town was where the Europeans lived. Despite the cameleers' historical and instrumental role in the development of NSW, the lack of substantive material and proprietary claims to 'place' on the part of most of these men denied them recognition as a constituent community within the emerging cultural fabric of the new nation. Along with Aboriginal people, the Afghans experienced racial discrimination and both spatial and economic marginalisation in the Australia of the early twentieth-century (Scriver, 2004). Labour unions representing the powerful lobby of white teamsters had long orchestrated racist antagonism against the Afghans in an unsuccessful bid to exclude them and their camels from the transport business. But once the teamsters began to replace their horses with motorised vehicles, the competitive advantage of camels was rapidly overcome. By the time of the First World War, there was little place or purpose remaining for the camels and the Afghans within NSW (Scriver, 2004). Out-of-work cameleers were compelled to come in from the bush and shift into other forms of employment wherever they could find it. Many became hawkers and day labourers, eking out a living in the margins of larger urban settlements such as Adelaide and Broken Hill. Following the war, camel transport was finally eclipsed in Australia. In due course the Afghan cameleers substantially vanished. Some returned to Afghanistan or resettled in the new Islamic state of Pakistan that emerged. Most Afghans who came to Australia were single or if married left their wives behind as they expected to return wealthy. Many remained single; others married Aboriginal women and a few married European women. Those who took wives in Australia were ultimately assimilated, according to the strict segregationist policies of the government, into either the Aboriginal or European communities. Even the Ghan towns-the only material places the Afghans had called home-were gradually abandoned as they lost their economic base. Australia's first mosque was built at Maree in northern South Australia in 1861, the first large mosque was built in Adelaide in 1890, and the first mosque in NSW in Broken Hill in 1887. 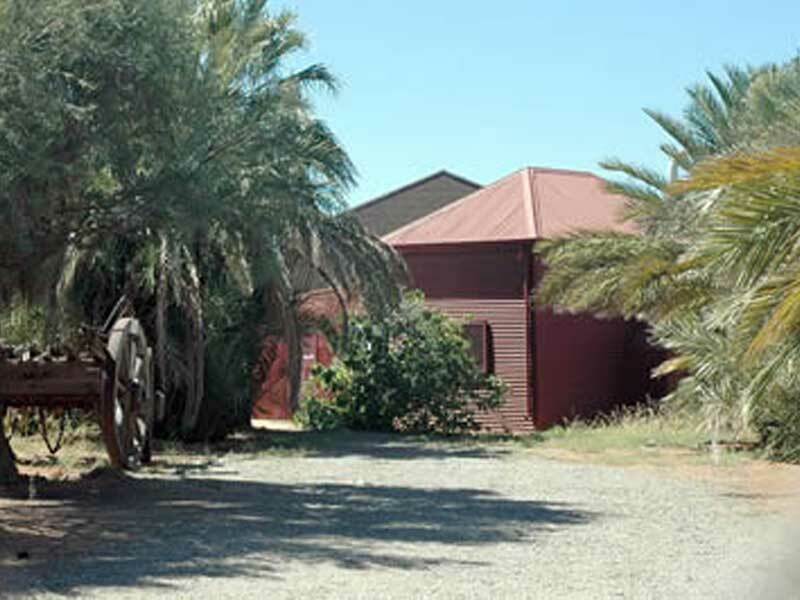 The mosque was originally located at a camp in West Broken Hill and was relocated to its present site about 1903-1904. It was constructed by the Afghans and comprises a modest structure made from wood and corrugated iron sheeting, painted rust red (which is the colour of the original mosque and a typical colour of Broken Hill). The adjoining anteroom is also constructed of the same materials. The mosque sits on a dusty site at the edge of town, with an avenue of date palm trees, planted in 1965 by the Broken Hill Historical Society. At the entrance of the site are two olive trees which were planted by The Islamic Council of NSW in December 2008. Surrounding the mosque are original camel wagon wheels made from wood and iron used by prominent Afghans in the town; mainly Shamroze Khan and Poujen Khan. To the far eastern corner of the site is the water trough used by the men to make their ablutions before they entered the mosque. Upon removing their footwear the men stood beside the concrete channel as water was poured over their feet and they entered the mosque using specially constructed stepping stones which are now housed in the adjoining museum. "Two camps of teamsters on the sandy outskirts of the town, squalid collections of rusty corrugated iron and hessian humpies. They were at most two roomed dwellings . . . narrow, rutted lines bisected the huts. There was a stone built mosque in a small, sandy square, its low minaret scantily shaded by a dusty pepper tree. They were picturesquely squalid characters, known popularly among us in boyhood years as "hooshtas" from the command they gave the camels... All of them wore turbans and long baggy white cotton trousers. Sunday mornings we visited the "Ghan" camps...Children in large number played in the dust at the doors of the huts..." (Solomon, 1988). The men, particularly the older and more devout Muslims, went to the mosque regularly; especially on Friday which is the traditional Muslim day of gathering. Some Afghans would not work on a Friday between noon and 2 pm. A mosque attendant would call the men to prayer by singing out loudly from the mosque's grounds. One Broken Hill Afghan descendant, Abdul Fazulla, could recall seeing such a person, Mohamed Raffeeg, standing on the cement outside the mosque, putting his hands cupped with palms outward to the side of his face and making the call to prayer. His voice travelled over the camp to the Ghan town at the north end of Chapple Street (Rajkowski, 1987). If the devotees were not near a mosque for the morning or evening prayers, they would pray wherever they were. Many old-timers from Broken Hill recall seeing Afghans in the bush working with their camel trains, stopping mid way at a certain time, kneeling on their mats praying (Rajkowski, 1987). The mosque was well used even when the Ghan community diminished in later years and the few Muslims remaining in Broken Hill continued to use it regularly up till 1940 and then less frequently until the death of the last Mullah in the 1950's. After his death the mosque fell into disuse and was vandalised. Dost Mahomet was a prominent Afghan Camel driver who worked at Broken Hill. He arrived with the camels and later travelled part of the distance and assisted the explorers. His grave lies three kilometres from Menindee, on the road to Broken Hill, and is the first known Muslim person to be buried on Australian soil (Matthews, 1997). At present there are few descendants of the early Afghan families in Broken Hill. The mosque has been renovated and refurnished by members and friends of the Broken Hill Historical Society and the Islamic Council of NSW to mark a unique but important phase in the development of transport in the West Darling district of NSW. The Broken Hill Mosque is located on the corner of 703 William Street and 246 Buck Street, Broken Hill. However this is not the initial site of the mosque. The Cameleers lived in two camps, one at North Broken Hill, off the end of Chapple Street, and the other camp at West Broken Hill on the corner of Kaolin and Brown Streets. There was a small mosque at the west camp which was relocated when the area was developed for houses and placed behind the mosque at the main north camp. The land upon which the Broken Hill Mosque currently sits was first granted in 1891 as part of 'Portion 1940', bought by David (or Daniel) Miller of Broken Hill (Hanna, 2009). In 1903 Miller sold the portion to 'Afzul of Broken Hill, camel driver'. It fell to disrepair after the death of Afzul, the last regularly practising Muslim and acting Mullah. The land and mosque was then acquired by his son, Abdul Fazulla of Broken Hill, a truck carrier/labourer in 1961 (Hanna, 2009). After Council had acquired the title to the block for non payment of rates, it was renovated and refurnished by members and friends of the Broken Hill Historical Society who are now its trustees. In September 1968 it was officially opened. The ceremony was attended by the Towns Mayor and visitors from a mosque in Adelaide were invited to worship and bless the site to show it be a sacred and Holy place in NSW's Islamic community and culture. The mosque is one of the last remaining remnants of "Afghan" immigration to NSW and embodies, in built form, early Islamic culture in Australia which is otherwise not so significantly represented in the State. A small museum has been established in the anteroom of the mosque for display of camel bells, nose pegs, photographs, the original stepping stones, camel saddles, traditional female and male headgear from Baluchistan, and in a glass showcase is a walking stick that belonged to the last Mullah along with other items associated with the Islamic religion. The museum is open to the public every Sunday from 2pm-4pm and can be opened for worship on request. Peter Scriver,2004 Mosques, Ghantowns and Cameleers in the Settlement History of Colonial Australia. Rosamund Burton Dr. Anne Monsour and Paul Convy, 2006, Into the Red New South Wales, www.news.com.au. Jenny Camilleri -Presdident of the Broken Hill Historical Society Inc, 2009, Personal communications with Patrica Assad at the Heritage Branch. Kevin Baker, 2006, Mutiny, Terrorism, riots and murder: A history of sedition in Australia and New Zealand. R.J. Solomon, 1988, The Richest lode: Broken Hill 1883-1988 . Roberta J Drewery, 2008, Treks, Camps, and Camels: Afghan Cameleers and their contribution to Australia.